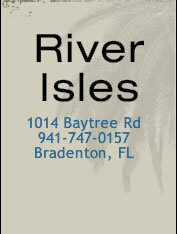 River Isles is a deed-restricted community. As homeowners, it is your responsibility to notify your realtors (should you list your home for sale) or any potential buyer (should you be selling the home on your own) about the governing documents for our community (Covenants and Bylaws). Your copies should be passed along to the buyer. Realtors, please note we have a new application process in place. Perspective buyers must attend an informational meeting to learn about the governing documents and acknowledge they have done so. Please call the River Isles Homeowners Association office for further information (941-747-0157).